Learn why online etiquette are important. Along with the definition, we are also listing tips and examples of common etiquette to be followed while using Internet facilities like email, Facebook, Twitter etc. It is so much easier to know someone when you meet in person and form an impression about them based on their body language, facial expression, voice tone etc. But it is difficult to do the same when you interact with someone online. What do you do to get a brief insight about the person on the other end? In such a situation we are often judged by our Online Etiquette. But how do we define Online Etiquette? Well, it is the correct or acceptable way of communicating or behaving on the Internet. So it becomes important, that we abide by certain ground rules while communicating online. You need to be cautious with professional or personal emails, social media postings, forwarding emails and posts, commenting on posts etc. You need to maintain a certain level of decorum and be sensitive to your surroundings. 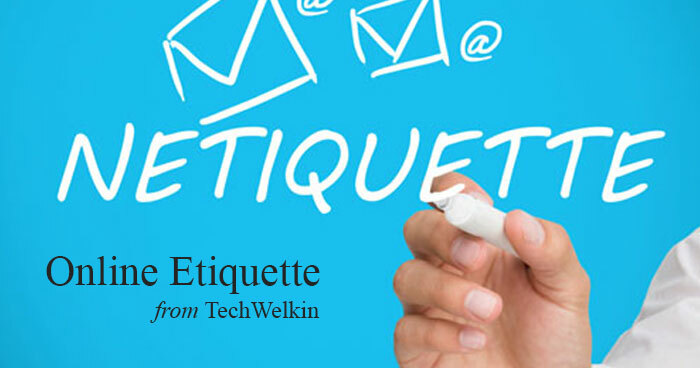 In this article we will share a few guidelines to help you with etiquette in your professional and personal online communication. The guidelines shared in the article are based on the personal experiences and the positive impact of the practice over a period of time. It is important to create and maintain a very professional tone in your online correspondence, as the slightest slip-up online can have serious repercussions. Avoid flowery language in business communication, be precise and to the point. Have an effective and short subject line that will compel the recipient to read the email. For example, your subject line could be the most important information like “Appraisal Feedback”. The recipient would immediately know what the email is about and read it without delay. Avoid endless exchange of emails or text messages. They can be frustrating and eventually create confusion. When a long email becomes a necessity, be respectful of your email recipients by making it as easy to read as possible. Put the most important information at the top and organize with bullets and short paragraphs. Instead of the email strings, for clarity’s sake, it is advisable to move the conversation to the phone. Be an observer. Watch how friends and colleagues interact to learn what is acceptable and what is not. Avoid sarcasm, aggression or make innuendos. In person, such strategies sometimes work because of our body language, expression and tone, wherein we are able to justify our actions and the intent. But in online exchange such strategies are prone to misinterpretation. Online etiquette suggest that you must be sensitive to your virtual recipients. After all they are humans too. So, it is important to show character and exercise self-control. Quotes, personal messages and emoticons are best avoided in business context irrespective of the rapport that you share with the recipient. Use “Thanks” or “Thank you” when signing off and of course do not forget to mention your name. Of late, ending email with initials is also considered ‘standard’ in business communication as it is crispier. Avoid using your pet name to sign off an official communication. Autocorrect can be a blessing and a bane. So watch out for embarrassing gaffes, all the more on your mobile devices. Follow the grammar and punctuation rules in any virtual communication including emails, Facebook, Twitter or blogging. Never abuse or curse. Remember whatever the trend, a well phrased, and easy to understand sentence in simple English is an eye catcher. Online etiquette warrant that you do not attach multiple files in an mail, instead ZIP the files. Reduce the size of pictures and attachments. Optimize the size of pictures and attachments for e-mail to avoid exceeding the maximum message size limits associated with most e-mail accounts. For how long does an email sit in your inbox? What is stopping you to respond? Emily Post’s Etiquette recommends replying within a day or two for personal messages and within 24 hours for business matters depending on their urgency. Besides, no one can deduce your silence, so whatever the reason, do acknowledge the email and write back as to when you plan to respond in detail. This will prevent follow up emails from the recipient waiting for your response. Turn off read receipts, if any, on your phone and email. You may risk offending the recipients, who may view the tactic as a suggestion that you do not trust them to open and read an email! Do not forward messages and emails blindly to others. Maybe the mail from your Boss or friend was meant only for you. Did you check the content? If in doubt, ask the sender. Think before you forward the mail or the message as you cannot undo the action. Restrict official communication within official hours, unless it is urgent and you have no choice, but to communicate at an odd hour. Respect the recipient’s private space and time. This holds true for communications with your friends as well. It can be offending when someone forwards a joke in the wee hours and you wake up with a start from your deep sleep because of the message alert sound. Choose the right medium to communicate. Does your cousin prefer emails or instant messaging? Does your friend checks Facebook occasionally? You must realize that if you send them an invitation on Facebook, both will never respond as your cousin never checks Facebook and your friend rarely does. An email to both would have probably fetched an instant response. Besides using the right medium — it is also important to use the right tools too. Knowing how to use a fork and knife correctly is similar to knowing the protocols of virtual communications. Therefore, it important that you familiarize yourself with the protocols of virtual communications. Not very many check voice mails anymore. What is really offending is sending an email to convey that you have left a voice mail! Leaving a voice mail followed by an email to inform used to be my senior’s favorite communication method in office! Most prefer text based communication, at least for initial contact. If you are stepping out for lunch with colleagues or friends, always excuse yourself and your device in the company of others. Respect the privacy of others when tagging on social media. When in doubt do not post or use the appropriate settings to restrict the audience. Do not be afraid to un-friend or un-follow someone and do not be offended if you have been un-followed or un-friended. Sometimes it is just simply a matter of pruning old relationships, both online and offline. Emails and social media are good precursors to more formal methods in the case of occasions and events. But despite the huge social pressure you do not have to feel obligated to respond to everything publicly. Why not get in touch in real life too? Nothing can compensate a personal invitation or acceptance to friends for a special occasion than doing it publicly. Few things are always truly private. Emily Post’s Etiquette mentions “if you cannot post it on a public bulletin board, do not write it and send it in an email”. By adhering to these simple but effective rules of the Internet, you will be sure to develop successful online business and personal relationships. Chances are that my experience may not match yours. 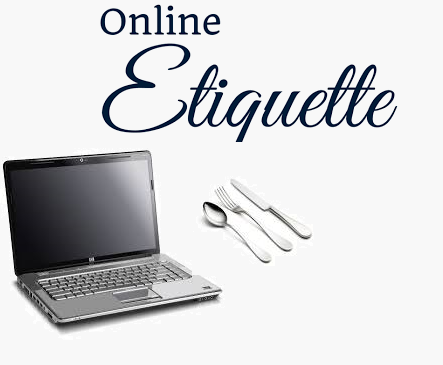 So feel free to share your thoughts and experience when it comes to online etiquette.